An updated rendering of The SoNo Collection, without the hotel that had been planned to be built over Bloomingdale’s. 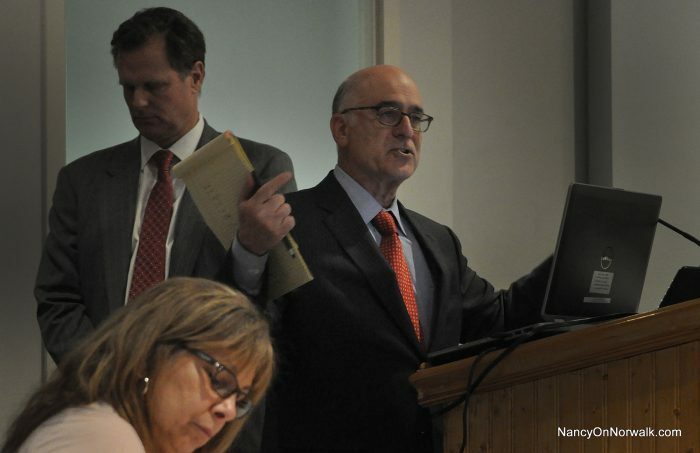 Attorney William Hennessey, right, represents GGP at Tuesday’s Common Council meeting in City Hall. 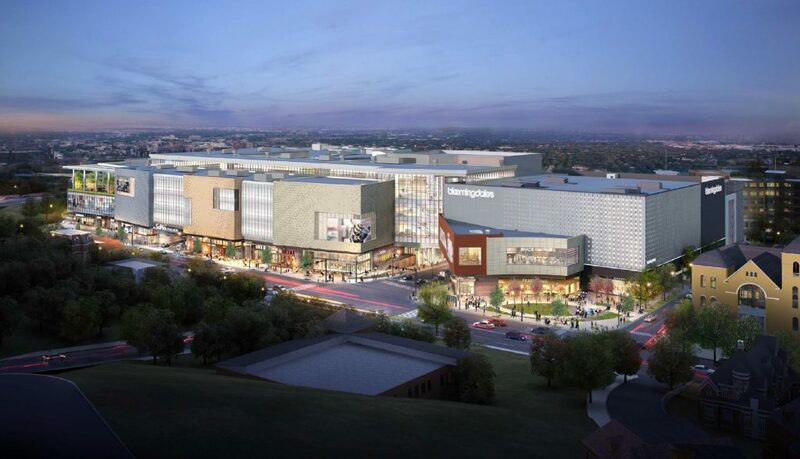 NORWALK, Conn. – Yes, Norwalk is going ahead with allowing mall developer GGP to make its pitch to various governmental bodies, asking to build The SoNo Collection without building a hotel over Bloomingdale’s, to pay the city $3.5 million instead. The discussion at Tuesday’s Common Council meeting featured GGP defending its request, responding to public criticism, and Mayor Harry Rilling explaining what commenter Diane Cece, at the beginning of the meeting, called the “back room negotiations” to arrive at what was announced seemingly as a done deal. “The meetings that were held with Council leadership and others were to try to come to an agreement or an arrangement that we felt everybody could buy into. A proposal,” Rilling said. “In other words, we are still on Let’s Make a Deal instead of The Price Is Right,” Council member Steve Serasis (D-District A) said. “If that’s the way you want to put it,” Rilling said, laughing along with others. From left, Common Council member Shannon O’Toole Giandurco (R-District D), Corporation Counsel Mario Coppola and Attorney Eric Bernheim confer before Tuesday’s Common Council meeting in City Hall. The Council voted 12-1 to go ahead with the process after adding a requirement that at least two public hearings be held, at the request of Council member Shannon O’Toole Giandurco (R-District D) and Minority Leader Michelle Maggio (R-District C). That was after Redevelopment Agency Executive Director Tim Sheehan explained that three public hearings were likely. RDA will hold one hearing each on the proposed changes to the Urban Renewal Plan and the Land Disposition Agreement; Planning Committee Chairman John Kydes (D-District C) said his Committee would also hold a public hearing. Public comment is welcome at all the meetings, Sheehan said. The Zoning Commission will also have a public hearing, Attorney William Hennessey said, representing GGP. Although GGP is requesting an expedited process, Sheehan acknowledged that the Boards and Commissions will take the time needed to consider the request. GGP is reportedly planning to begin digging a foundation in early May ahead of the approvals in an effort to open in October 2019 to satisfy its deals with Nordstrom and Bloomingdale’s. If that deadline is not met GGP will lose one of its anchors, Hennessey said. “I strongly believe that a project that will produce in excess of $5 million annually in tax revenue and over 2,400 full-time jobs should at least have its developer heard and the request entertained,” Kydes said, opening the conversation. GGP hired a hotel architect and a hotel construction company, trying in earnest to make the hotel work, and spoke to “upwards of 12” hotel vendors, GGP senior planner Doug Adams said. “The feedback was very consistent,” he said. Last summer and fall, GGP began discussing the possibility of not building a hotel, and in December one of the final candidates backed out, he said. “I think everyone here is disappointed but again we are out of time in terms of trying to get something to work, when we are certain it won’t work,” Adams said. Council Finance Committee Chairman Bruce Kimmel (D-At Large) asked Adams to respond to criticisms levied by Bob Welsh, who studied GGP’s figures and concluded that dropping the hotel will save the company $2 million a year, while Norwalk gets the equivalent of $200,000 a year for 17.5 years. “The net operating income of the property doesn’t include a lot of the other corporate overhead,” Adams said. Adams spoke of dividends to shareholders and the cost of capital. You might say you could build a house for $550,000, knowing that the end result will be worth $300,000, and accept the $200,000 loss, he said. “There is a value to that income stream that is just unsustainable to just accept that as a loss. It takes the overall project to a place where the company would not invest the capital,” Adams said. Again, GGP does not develop hotels and needs a partner in the venture, which would look at it as an independent investor would, he said. Serasis asked why 50 percent is not feasible. The property is unique; to build the core asset, the mall, “there are certain dimensions and size that need to be maintained and the site is extremely tight with boundaries that cannot be modified,” Adams said, mentioning the railroad line, West Avenue and Interstate 95. Kimmel, earlier in the meeting, asked Sheehan if alternatives could be discussed as part of the ongoing process. Those could include the $3.5 million, or a YMCA or Boys and Girls Club, or an incubator, which were all mentioned by public commenters. Council member Rich Bonenfant (R-At Large) suggested that perhaps the Enterprise Zone could be scaled back. Hennessey, defending the request to change the definition of Class A anchor, said GGP is obligated to have Class A anchors 17 years from now. “This mall is being built not to be up for 15 years, this mall is being built to be up and be a proud part of this community for decades and decades,” Hennessey said. Bloomingdale’s and Nordstrom have agreements with GGP that go beyond 10 years, but at some point GGP may need to replace them, he said. “We want to be in the position where we can do that responsibly in a way that always maintains this as a class a mall. Our goal is your goal in this endeavor. We are completely aligned in our interests,” Hennessey said. Council member Tom Livingston (D-District E) said that last week there was an article about high end malls thriving. A Class A mall in an affluent area thrives, Hennessey said. “We believe this is the perfect spot in America to build this facility, and when this facility is built it will a Class A mall. It will be at the top of the food chain in terms of retail facilities,” Hennessey said. The vote on Giandurco’s amendment, to specify public hearings, had one no vote, from Kydes. Bonenfant voted against going ahead with the process. Council members Mike DePalma (D-District D) and Doug Hempstead (R-At Large) were absent. Hempstead announced last week that he is recusing himself from the GGP discussions, because he is working with the company as a Stew Leonard’s executive. Why two additional public meetings, five meetings in total? I’m all for public participation but why? So the same people can come and make the same arguments over and over again against the mall? Thank you John Kydes for voting no. “I strongly believe that a project that will produce in excess of $5 million annually in tax revenue and over 2,400 full-time jobs should at least have its developer heard and the request entertained,” Kydes said.” Ditto. Plus it would add an asset to Norwalk, replacing a 20+ year-old dead zone of activity seen predominately from I95. Are we looking at stall tactics? Is GGP looking for a way out? I was under the assumption that the building was to begin December 2016, and that it was ready to move forward. I also kept saying that GGP has malls all over the country and that they certainly would not be building another if they thought it would fail. Are they now rethinking the viability of the project and looking for legal outs by way of stalling, changing, and possibly loosing their anchors (because of the stalling, changing and delaying)? I can’t believe that GGP would have agreed to a required hotel before verifying the viability of it. I am not getting a good feeling about his project moving forward, too much posturing still happening when it was supposed to be a go….Just my thoughts. @Sue Haynie, you’re absolutely correct. No reason for additional public meetings when the council clearly has little interest in listening to the public’s opinion on how this developement is executed. Committee members, the mayor and the RDA meet behind closed doors with GGP reps, hammer out a deal that excludes public input, returns to the public with proclamations that what we were originally promised cannot happen, and we are all supposed to sleep well at night. When elected and appointed officials are asked how we got here, they blame the developers. It’s never them. Well, the failure of this plan to get off the ground in a timely manner and including all the promised components of a mixed use development can’t be laid entirely at feet of the developers. The people we empower to negotiate with GGP bear equal responsibility for how this developement is executed. The mayor for one has a performance problem. He campaigned on this issue and has now reneged on that promise. Thank you Bruce Kimmel and Doug Adams for speaking to my questions about a deal in which GGP pays Norwalk the equivalent of $200k per year for an increase in income of $2 million per year. Doug Adams didn’t dispute the figure of $2 million in increased income for GGP. What he seems to be saying is that the increase is not all profit. That’s like saying a $10,000 raise isn’t really a $10,000 raise because the government collects 40% of it in taxes. Except in this case, the “taxes” are dividends to GGP shareholders. I didn’t hear any numbers in Doug’s response. I’d like to hear GGP’s own calculation of the yearly monetary benefit achieved from dropping the hotel, and hope to speak again with Doug on this, if he’s willing. @Sue and @Donna – interesting the you both assume the public opinion is against this – I’ve only attended two meetings on the proposal, but at both meetings the comments have been predominantly in favor of the project. My sense is the train has left the station, like it or not we are aboard, and we’re now negotiating which stop we’re going to for what ticket price. I was encouraged that Council members seem to want to negotiate the $3.5 million, which in my mind is way too low. Thank you also to the many Council members from both parties who insisted on the RDA’s confirmation that last night’s vote doesn’t require Norwalk to accept the deal as-is – changes are still possible to achieve a more balanced deal and greater community benefit. That includes Faye Bowman, Travis Simms, Steve Serasis, Bruce Kimmel, Michelle Maggio, Rich Bonenfant, and Shannon O’Toole-Giandurco. Taxpayers need to remember how Rilling and the council did not support the will of the people with this disaster. They need to all go come November. Question: Was the hotel something that Norwalk insisted on initially – or not? I have not met one person in Norwalk that is for this disaster. That is in the real world and not the Internet blogs. @Claire Schoen, I’m glad to hear that most of the public comments at the meetings that you’ve attended have been in favor of the mall. I stand corrected. I was basing my comments off of what I’ve read on this topic and the negative comments have seemed to predominate. I guess I had better attend one of the next 5 meetings and add to the chorus. Norwalk insisted on a mixed use component. There were studies done on the feasibility of residential space, office space and a hotel. GGP always said it doesn’t develop hotels, residential or office, but came to speak optimistically about putting a hotel on the site. @sue haynie – hope you will encourage all your friends and neighbors to attend as many public comment and hearings opportunities as possible – pro or con! Our government works best with an informed and engaged public. Having said, though, regrettably public sentiment doesn’t always make a darned difference – dozens and dozens spoke against the Big Box application for main ave and that was approved, and perhaps a hundred or more spoke against the cranbury zip line but council simply pulled the item, and never voted on it, and opted not to kill it in committee (meaning the proposal can come back at any time). Hundreds begged city officials to kill the East Ave bridge height clearance project, and our elected officials did little or nothing to help. I have always been in favor of this mall. Tom Livingston is right to point out that there is ample evidence that high end malls in affluent areas are striving, especially if these malls are forward-thinking with an emphasis on experience and lifestyle. Old, tired, and blend retailers are struggling, not solely because of the internet, but mostly because shoppers are gravitating to more exciting retailers and experiences. Here is a link to an article which is particularly illuminating as to what success looks like in retail today. Hopefully, this is what GGP is building for us. Considering the scale and long-term impact of this project, a business-savvy mayor would have hired experts to advise the city. Much like GGP hired expect Larry Cafero to advise them on navigating Norwalk politics. An expert would have told the city a hotel was never going to work and would have helped formulate more creative and suited alternatives that would both have satisfied the city’s desire for public realms and non-retail use, as well as help GGP create a 21st-century complex, not just a mall. Bob – the increase in $2.0 million of NOI (Net Operating Income) is before any financing costs – debt or equity. Remember someone has to pay for this and those that pay require a return. So a significant portion of the NOI is used to pay back banks and equity participants. Likely to the tune of 70-90% of the available NOI so the real profit to GGP is more like $200,000 to $600,000. Here’s the interesting part that GGP did not explain well. If the NOI is $2.0 million lower the overall value would be approximately $36,360,000 lower. Now that’s a real loss of tax revenue to have a project like this worth $36 million less. How much, (($36,360,000 x .7)/$1,000) x 25.444 = $647,600. So in addition to losing the $200,000 GGP is offering we would also potentially lose $647,600 in additional tax revenue. GGP paid $35 million for this land in 2013. At that price I would never expect to call this a public private partnership so maybe we should stop acting like it is. It’s now 2017 (4 long years later) and RDA wants more public meetings and input from people who really have little or no concept about how these projects work or are financed. Clay Fowler has the best analogy –“it’s like me telling GE how to build a nuclear power plant”. We are wasting time, the window is closing. 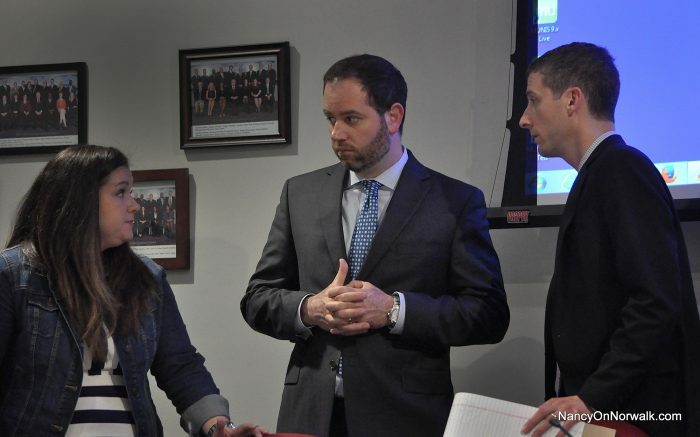 The Norwalk process is broken and this is yet another prime example – calling for more public meetings so that good intentioned but un-informed people can throw more wrenches in works. If GGP can’t complete by 2019 we (not they) we, as in Norwalk and GGP, stand to lose Nordstrom’s and Bloomingdales. And for what? GGP paid top dollar for the right to build a successful project, let’s let them do that. Scrap the LDA, it’s already caused two other well qualified developers to walk away. Let’s not make it three. Sidebar – The City should have a professional real estate consultant model this development in ARGUS which is the industry standard software for the financial modelling of complex commercial properties. This would take a pro about a couple of days to load in all the data. It may take several weeks or a month to gather the data but it appears much of that is already done, but I’m sure some is data missing based on experience. Once loaded the various scenarios can be run, with hotel, without hotel, etc. Any variable can be tested. We can even adjust for time to show the huge costs our process imposes on a developer. Very sobering. This would give the CC that ability to conduct feasibility study in almost real time reflecting any reasonable development variable. The cost to the City to have a pro do this (ARUGUS modeling) ~ $7,000 – $10,000. This would give the CC the power of knowledge from which to make informed decisions. @Claire, my comment was not based on the assumption that more Norwalk citizens are against the mall than for the mall. It’s that citizens have not always played much part in how decisions are made. I don’t object to development of this site by GGP. It’s the execution and the change in the LDA that I object to. And in my opinion all the responsibility for this failure lies with our city officials. To be absolutely fair, GGP *IS* starting the project shortly. They are going shovels in the ground on the dig for the underground parking lot, even as this item is negotiated, because if they don’t start now, they can’t complete in time to meet the 2019 opening date required in the contracts with the anchors. As far as the hotel component goes, they opted for the hotel as the most viable choice among the uses that qualify for mixed use. They knew they’d need a partner and they’ve been unable to secure one–reportedly because of the economics of the project. Unfortunately the consultant report that was provided to show the numbers supporting the conclusion that the hotel was unfeasible started with assumptions about a full service hotel, with a banquet hall and all kinds of things that were not under consideration when the hotel was added to the plan in the first place. GGP concluded back in 2014 that a “limited service” hotel was the only thing they thought the market would support. At the end of the day, Mr. McGuire is correct. Since GGP has been unwilling to provide the calculations, and we have no before and after comparisons of anything OTHER than the property tax calculations used to propose a payoff amount, there is no way for Council to evaluate whether it makes more sense to facilitate the project, and at what cost. As for scrapping the LDA (or more to the point–the requirement for mixed use), everyone should be reminded that the requirement is partly there to ensure that full public benefit is reaped from properties taken by eminent domain. No private entity is supposed to benefit from an eminent domain taking–so let’s stop pretending that this one should be treated solely as a business proposition. Also, pretending that the only other option is the “hole in the ground” just because the land has never been developed before now. We have no idea what other options might have been brought over the years if the LDA didn’t require mixed use. If I were one of the previous owners, I’d be really ticked that the city held to the rules all these years and then changed them now. Mike is right about the city needing help with it’s commercial real estate modeling. We don’t do this well at all as a city. I have a spreadsheet that I have been maintaining and we have lost millions of dollars due to our commercial property not being assessed correctly. Isabelle – those articles you are reading really apply to low end malls or malls in the middle of America. If you read all the the numbers the high end malls especially in coastal communities are thriving. They are building malls in areas with higher densities and the easy ability to move goods. Our community fits this requirement perfectly. The issue with this project is that it shouldn’t be mixed use. There should never been a hotel attached to this project. This is a good project and the city needs to streamline the approvals and get the shovels in the ground. I am tired of all of the public hearings and all of the naysayers. Start digging and start building!!!! And there goes the magic word “naysayers”. Nora, would you kindly share your spreadsheet with the rest of the citizenry via NON? I just reached out to the city to try to figure out a way to assemble this information. Someone else was speculating that our commercial real estate is chronically undervalued and I thought I’d try to help get the question answered. It sure would help if various well-intended citizens weren’t duplicating efforts. It would also help for all of the “experts” in real estate to explain to the rest of us how the introduction of a massive new retail center fixes the undervaluation of commercial property elsewhere in Norwalk. Aren’t the odds in favor of this project being undervalued and under-collected too? Especially since GGP has a history of challenging its assessments? A history of rewriting its own agreements with the city? Real estate is the only non-renewable resource in the city. Some of us are tired of seeing our city fall piecemeal to every wacky proposal that comes with a little (future) money attached to it. We need clear planning, clear thinking and clear results and we need decision-makers who aren’t afraid to demand those results and second-guess decisions made by previous leaders at every turn, just because we can’t imagine anything more from an “up from zero” valuation of any proposal. If Norwalk had considered, through thoughtful and diligent planning, that the best way to develop that site was to lift the mixed use requirements , it should have done so BEFORE any proposal was on the table. If that property had gone on the market without restrictions, we can’t know what kinds of developments might have been attracted to the site. The fact is, eminent domain was used to take those properties and the city’s decision with respect to that site, even as recently as 2014 was to retain mixed use on the site. GGP bought the lot, knowing the requirements. They gambled that they could talk the city into modifying the agreement. At the end of the day, we are being offered NOTHING that we wouldn’t have received if the lot were sold to GGP unencumbered. They still would have purchased the air rights, made minimal investments in signage, infrastructure, way-finding, connectivity and public realm. We’d still be getting the exact same potential property tax revenue and the same potential number of jobs, and potential associated economic activity for the area. Which brings us back to erasing the history of how we got to where we are and evaluating this deal as if it were being brought to us for the very first time, on an unencumbered site, with the enterprise credits and tax abatements attached. I maintain that, on balance, Norwalk fares extremely poorly vs the benefits for the rest of the region, and it will bear a huge brunt in impacts to the area that offset what the property taxes might be. And that only holds if all of the economic assumptions about the success of a class A mall hold for this area. If it doesn’t, we are going to be in a world of hurt. Great points by Debora. There should be no more subsidies for this project. No more enterprise zone. No more LDA. No involvement by the Redevelopment Agency. No more Redevelopment Agency. and to Bill and Debora – thanks for the illustration of the root-cause-analysis, which Norwalk neither embraces nor respects when others conduct it! I concur with Bill’s conclusion. Agree with Debora on the “naysayers” comment. Thank goodness for those brave souls in this city who dare to ask questions; challenge the status quo; and refuse to accept “because we said so” as an appropriate answer to taxpayers. After years of allowing Clay Fowler to sit on the property and build NOTHING, not only aren’t there any punitive penalties imposed, we actually reward the guy by extending the coveted enterprise zone tax deferral status! and for what? so he can sell the property to a mall developer, one who either assumed or was outright told they could build just a mall, and there would never end up being a mixed used requirement. People need to start asking the basic questions, starting with the most important : Why did GGP buy a property emcumbered with mixed-use restrictions? Why did our Common Council allow the transfer of the LDA to GGP? How can GGP satisfy the URP by claiming its fulfilled by OTHER developers already?